We like to work closely with each client from the outset, ensuring that you will receive a unique and beautiful bespoke design to suit your wedding theme and colour scheme - a true centrepiece and focal point for you and your guests. 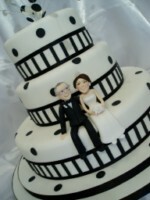 We would be delighted to arrange a consultation for you to discuss your requirements - and to sample our cakes. We allow plenty of time for every consultation, taking great care to ensure your cake not only suits your occasion and venue, but most importantly, you and your personality! We have a vast on line gallery of our stunning wedding cake designs to choose from too which we can adapt to your specifications. 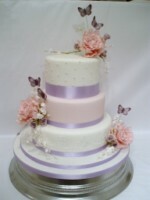 To see examples of our cakes please select GALLERY on the menu bar and then a category by clicking one of the boxes. 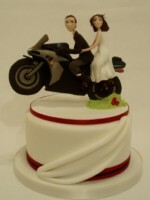 We also make personalised bride and grooms. For more information please select the Bride and Groom page from the menu and also view our Bride and Groom gallery. In addition we make our own chocolates and shortbread Cookie Wedding Favours which will compliment any table setting and provide a unique individual gift for your guests. 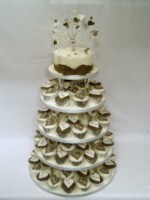 Discounts are available on the favour cookies/chocolates when also booking your wedding cake with us. To view favour cookies select the Individual Favour Cookies box from the gallery. 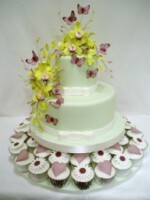 A new and contemporary approach to wedding cakes is to have individual cup cakes or mini cakes, one for every guest. Cup cakes can be made in two of your favourite sponge cake flavours and baked in a variety of cup cases - gold ,silver, plain coloured or patterned - to suit your wedding theme. Each cake can be decorated with either large heart shapes, delicate edible butterflies, rosebuds/blossoms/flowers, or piped initials, on a swirl of piped butter cream or a circle of sugar paste. 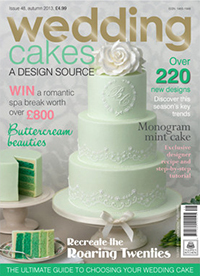 Colours of the icing and decoration can also be made to fit in with your wedding theme. Other options are available, please contact us for further details. The individual mini cakes are 3" across and 2 layers of sponge deep sandwiched together with buttercream and covered all over with sugarpaste icing on their own 4" cake card. Decorative options are similar to the cup cakes but we are always open to suggestions, A 6” decorated cake as a top tier in sponge or fruit cake can be added. 1. A perspex stand which is adjustable for up to 7 tiers taking a maximum of 75 cup cakes or 60 individual cakes. However it’s no problem if there is more than 75 as it looks really nice to have them placed on the table around the stand. We are pleased to offer complimentary hire of this stand to Scarborough venues. 2. Tiers of iced cake boards and cake pillars with ribbon edging. We make these ourselves the right size to display the amount of cup cakes you require. Customers are able to choose their own colours to have them made as they wish. 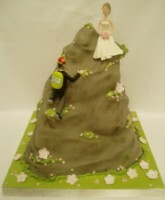 Please view our gallery of Wedding Cup Cakes and Individual Mini Cakes for examples. A tiered wedding cake can be supported in a number of ways , one of which can be the use of cake pillars. We've taken that idea one step further and made them a decorative feature by modelling sugar paste animals and popular characters around them. The pillars are plastic tubes which go all the way down inside the cake though on the surface it appears as if the models are actually holding up the tiers! 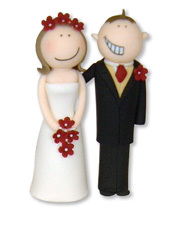 Why not have a personalised handmade Bride and Groom cake topper which can be saved as a keepsake of your special day? These are available in either edible modelling sugar or the more durable non-edible modelling medium Arista Soft. We make them on 4” round covered board which fit perfectly on a 5” or 6” cake, although other sizes are available upon request. Examples of these can be viewed in our Bride and Groom gallery. If you browse through our gallery of models you will see that just about anything is possible! We can create your favourite cartoon or T.V. characters, pop stars or members of your family, pets and friends. Please fill in the quote request form for models to obtain a quote.